LOS ANGELES, CA – One good deed can change the world. 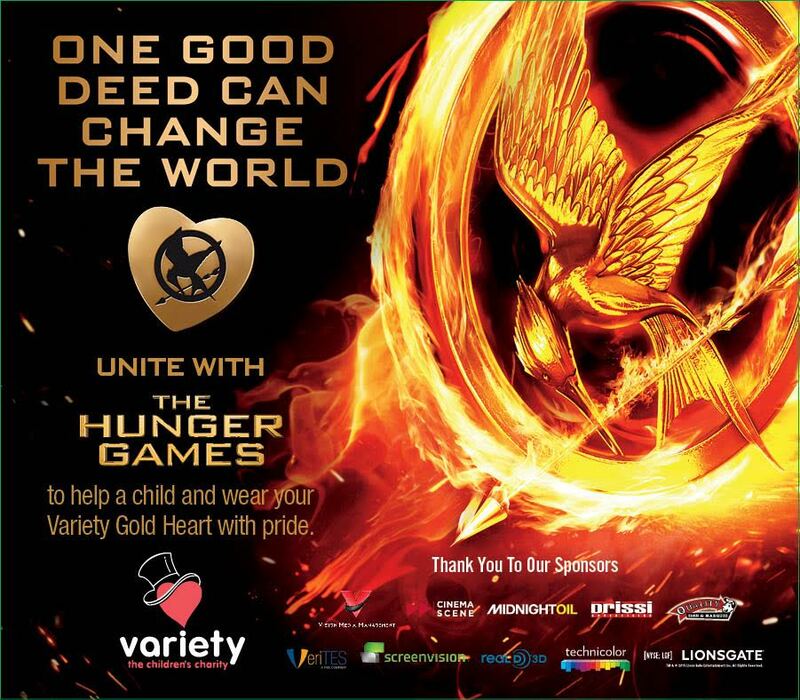 Lionsgate has collaborated with Variety – the Children’s Charity to create limited edition pins featuring the fourth film in the studio’s blockbuster franchise, “The Hunger Games: Mockingjay – Part 2,” which premieres November 20. Proceeds from the pins, which are for Variety’s 26th annual Gold Heart Campaign, will benefit Variety programs that provide life-saving, life-changing, and life-enriching equipment and services to children who have a disability or are disadvantaged. The collector’s item will be available for a minimum donation of $3.00 in movie theatres and select retail outlets nationwide from November 2015 – March 2016. A full list of participating locations can be found on www.usvariety.org. With an 86-year legacy of caring for children across the globe when family income, insurance, and the government cannot, Variety -the Children’s Charity has grown to 41 chapters in 11 countries and raised more than $1 billion to assist the treatment and care of children who are disabled and disadvantaged. Through direct grants and programs, Variety provides the gifts of independence, self-esteem, mobility and communication; survival, recovery, well-being and health; and education, confidence and achievement for children who are disabled and disadvantaged. Motion Picture Artwork ™ & © 2015 Lions Gate Entertainment Inc. All Rights Reserved.